Saint Pierre and Miquelon, officially the Overseas Collectivity of Saint Pierre and Miquelon (French: Collectivité d'Outre-mer de Saint-Pierre-et-Miquelon; French pronunciation: ​[sɛ̃.pjɛʁ.e.mi.klɔ̃]), is a self-governing territorial overseas collectivity of France, situated in the northwestern Atlantic Ocean near the Canadian province of Newfoundland and Labrador. It is the only part of New France that remains under French control, with an area of 242 square kilometres (93 sq mi) and a population of 6,080 at the January 2011 census. The islands are situated in the Gulf of St. Lawrence near the entrance of Fortune Bay, which extends into the southwestern coast of Newfoundland, near the Grand Banks of Newfoundland. They are 3,819 kilometres (2,373 mi) from Brest, the nearest point in Metropolitan France, and 25 kilometres (16 mi) from the Burin Peninsula of Newfoundland. Saint-Pierre aerial photo, 2013. Saint-Pierre Airport is at the lower right. Wikimedia Commons has extensive annotations. Saint-Pierre is French for Saint Peter, the patron saint of fishermen. The present name of Miquelon was first noted in the form of Micquelle in the Basque sailor Martin de Hoyarçabal's navigational pilot for Newfoundland. It has been claimed that the name Miquelon is a Basque form of Michael; Mikel and Mikels are usually named Mikelon in the Basque Country. Therefore, from Mikelon it may have been written in the French way with a q instead of a k.
Though the Basque Country is divided between Spain and France, most Basques live on the south side of the border and speak Spanish, and Miquelon may have been influenced by the Spanish name Miguelón, an augmentative form of Miguel meaning "big Michael". The adjoined island's name of "Langlade" is said to be an adaptation of l'île à l'Anglais (Englishman's Island). Portuguese João Álvares Fagundes landed on the islands on 21 October 1520 and named the St. Pierre island group the 'Eleven Thousand Virgins', as the day marked the feast day of St. Ursula and her virgin companions. They were made a French possession in 1536 by Jacques Cartier on behalf of the King of France. Though already frequented by Mi'kmaq people and Basque and Breton fishermen, the islands were not permanently settled until the end of the 17th century: four permanent inhabitants were counted in 1670, and 22 in 1691. In 1670, during Jean Talon's tenure as Intendant of New France, a French officer annexed the islands when he found a dozen French fishermen camped there. The British Royal Navy soon began to harass the French, pillaging their camps and ships. By the early 1700s, the islands were again uninhabited, and were ceded to the British by the Treaty of Utrecht which ended the War of the Spanish Succession in 1713. Under the terms of the Treaty of Paris (1763), which put an end to the Seven Years' War, France ceded all its North American possessions, but Saint-Pierre and Miquelon were returned to France. France also maintained fishing rights on the coasts of Newfoundland (French Shore). With France being allied with the Americans during the American Revolutionary War, Britain invaded and razed the colony in 1778, sending the entire population of 2,000 back to France. In 1793, the British landed in Saint-Pierre and, the following year, expelled the French population, and tried to install British settlers. The British colony was in turn sacked by French troops in 1796. The Treaty of Amiens of 1802 returned the islands to France, but Britain reoccupied them when hostilities recommenced the next year. The Treaty of Paris (1814) gave them back to France, though Britain occupied them yet again during the Hundred Days War. France then reclaimed the then uninhabited islands in which all structures and buildings had been destroyed or fallen into disrepair. The islands were resettled in 1816. The settlers were mostly Basques, Bretons and Normans, who were joined by various other elements, particularly from the nearby island of Newfoundland. Only around the middle of the century did increased fishing bring a certain prosperity to the little colony. During the early 1910s, the colony suffered severely as a result of unprofitable fisheries, and large numbers of its people emigrated to Nova Scotia and Quebec. The draft imposed on all male inhabitants of conscript age after the beginning of World War I crippled the fisheries, which could not be processed by the older people and the women and children. About 400 men from the colony served in the French military during World War I, 25% of whom died. The increase in the adoption of steam trawlers in the fisheries also contributed to the reduction in employment opportunities. Smuggling had always been an important economic activity in the islands, but it became especially prominent in the 1920s with the institution of prohibition in the United States. In 1931, the archipelago was reported to have imported 1,815,271 US gallons (1,511,529 imperial gallons; 6,871,550 litres) of whisky from Canada in 12 months, most of it to be smuggled into the United States. The end of prohibition in 1933 plunged the islands into economic depression. During World War II, despite opposition from Canada, Britain, and the United States, Charles de Gaulle seized the archipelago from Vichy France, to which the local government had pledged its allegiance. In a referendum the following day, the population endorsed the takeover by Free France. After the 1958 French constitutional referendum, Saint Pierre and Miquelon was given the option of becoming fully integrated with France, becoming a self-governing state within the French Community, or preserving the status of overseas territory; it decided to remain a territory. Locally used flag of Saint Pierre and Miquelon, modelled after the coat of arms. Since March 2003, Saint Pierre and Miquelon has been an overseas collectivity with a special status. The archipelago became an overseas territory in 1946, then an overseas department in 1976, before acquiring the status of territorial collectivity in 1985. The archipelago has two communes: Saint-Pierre and Miquelon-Langlade. A third commune, Isle-aux-Marins, existed until 1945, when it was absorbed by the municipality of Saint-Pierre. The inhabitants possess French citizenship and suffrage. Saint Pierre and Miquelon sends a senator and a deputy to the National Assembly of France in Paris, and enjoys a degree of autonomy concerning taxes, customs, and excise. France appoints the Prefect of Saint Pierre and Miquelon, who represents the national government in the territory. The Prefect is in charge of national interests, law enforcement, public order, and, under the conditions set by the statute of 1985, administrative control. The prefect as of December 2016[update] is Henri Jean, replacing Jean-Christophe Bouvier. The local legislative body, the Territorial Council (French: Conseil Territorial), has 19 members: four councillors from Miquelon-Langlade and 15 from Saint-Pierre. The President of the Territorial Council is the head of a delegation of "France in the name of Saint Pierre and Miquelon" for international events such as the annual meetings of NAFO and ICCAT. France is responsible for the defence of the islands. The Maritime Gendarmerie has maintained a patrol boat, the Fulmar, on the islands since 1997.Law enforcement in Saint Pierre and Miquelon is the responsibility of a branch of the French Gendarmerie Nationale. There are two police stations in the archipelago. 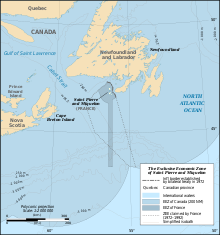 France claimed a 200-mile (320 km) exclusive economic zone for Saint-Pierre and Miquelon, and in August 1983 the naval ship Le Hénaff and the seismic ship Lucien Beaufort were sent to explore for oil in the disputed zone. In addition to the potential oil reserves, cod fishing rights on the Grand Banks of Newfoundland were at stake in the dispute. In the late 1980s, indications of declining fish stocks began to raise serious concern over the depletion of the fishery. In 1992, an arbitration panel awarded the islands an exclusive economic zone of 12,348 square kilometres (4,768 sq mi) to settle a longstanding territorial dispute with Canada, although it represents only 25% of what France had sought. The 1992 decision fixed the maritime boundaries between Canada and the islands, but did not demarcate the continental shelf. Located off the western end of the Newfoundland's Burin Peninsula, the archipelago of Saint Pierre and Miquelon is composed of eight islands, totalling 242 square kilometres (93 sq mi), and of which only two are inhabited. The islands are bare and rocky, with steep coasts, and only a thin layer of peat to soften the hard landscape. The islands are geologically part of the northeastern end of the Appalachian Mountains along with Newfoundland. Saint Pierre Island, whose area is smaller, 26 square kilometres (10 sq mi), is the most populous and the commercial and administrative center of the archipelago. A new airport, Saint-Pierre Airport, has been in operation since 1999 and is capable of accommodating long-haul flights from France. Miquelon-Langlade, the largest island, is in fact composed of two islands, Miquelon Island (also called Grande Miquelon), 110 square kilometres (42 sq mi), connected to Langlade Island (Petite Miquelon), 91 square kilometres (35 sq mi), by the Dune de Langlade, a 10-kilometre (6.2 mi) long sandy tombolo, A storm had severed them in the 18th century, separating the two islands for several decades, before currents reconstructed the isthmus. The waters between Langlade and Saint-Pierre were called "the Mouth of Hell" (French: Gueule d'Enfer) until about 1900, as more than 600 shipwrecks have been recorded in that point since 1800. In the north of Miquelon Island is the village of Miquelon-Langlade (710 inhabitants), while Langlade Island was almost deserted (only one inhabitant in the 1999 census). A third, formerly inhabited island, Isle-aux-Marins, known as Île-aux-Chiens until 1931 and located a short distance from the port of Saint-Pierre, has been uninhabited since 1963. Seabirds are the most common fauna. Seals and other wildlife can be found in the Grand Barachois Lagoon of Miquelon. Every spring, whales migrating to Greenland are visible off the coasts of Saint-Pierre and Miquelon. Trilobite fossils have been found on Langlade. The stone pillars off the island coasts called "L'anse aux Soldats" eroded away and disappeared in the 1970s. The rocky islands are barren, except for scrubby yews and junipers and thin volcanic soil. The forest cover of the hills, except in parts of Langlade, had been removed for fuel long ago. The archipelago is characterized by a cold borderline humid continental/subarctic climate, under the influence of polar air masses and the cold Labrador Current. The mild winters for being a subarctic climate also means it has influences of subpolar oceanic climate, thus being at the confluence of three climatic types. The February mean is just below the −3 °C (27 °F) isotherm for that classification. Due to just three months being above 10 °C (50 °F) in mean temperatures and winter lows being so mild, Saint Pierre and Miquelon has a Köppen Climate Classification of Dfc, if bordering on Cfc due to the mildness of the winter and either Dfb or Cfb due to the closeness of the fourth-and fifth-warmest months to having mean temperatures at or above 10 °C (50 °F). Typical maritime seasonal lag is also strong with September being warmer than June and March being colder than December. The average temperature is 5.3 °C (41.5 °F), with a temperature range of 19 °C (34 °F) between the warmest (15.7 °C (60.3 °F) in August) and coldest months (−3.6 °C (25.5 °F) in February). Precipitation is abundant (1,312 mm or 51.7 in per year) and regular (146 days per year), falling as snow and rain. Because of its location at the confluence of the cold waters of the Labrador Current and the warm waters of the Gulf Stream, the archipelago is also crossed a hundred days a year by fog banks, mainly in June and July. Two other climatic elements are remarkable: the extremely variable winds and haze during the spring to early summer. The inhabitants have traditionally earned their livelihood by fishing and by servicing fishing fleets operating off the coast of Newfoundland. The climate and the small amount of available land hardly favour activity such as farming and livestock (weather conditions are severe, confining the growing season to a few weeks, and the soil contains significant peat and clay and is largely infertile). Since 1992 the economy has been in steep decline, following the depletion of fish stocks due to overfishing, the limitation of fishing areas and the ban imposed on all cod fishing by the Canadian Government. The rise in unemployment has been countered by state financial aid for the retraining of businesses and individuals. The construction of the new airport helped sustain activity in the construction industry and public works. Fish farming, crab fishing and agriculture are being developed[by whom?] to diversify the local economy. The future of Saint Pierre and Miquelon rests on tourism, fisheries and aquaculture. Explorations are under way to exploit deposits of oil and gas. Tourism relies on the proximity to Canada, while commerce and crafts make up the bulk of the business sector. The labour market is characterized by high seasonality, due to climatic hazards. Traditionally, the inhabitants suspended all outdoor activities (construction, agriculture, etc.) between December and April. In 1999 the unemployment rate was 12.8%, and a third of the employed worked in the public sector. The employment situation was worsened by the complete cessation of deep-sea fishing, the traditional occupation of the islanders, as the unemployment rate in 1990 was lower at 9.5%. The unemployment for 2010 shows a decrease from 2009, from 7.7% to 7.1%. Exports are very low (5.1% of GDP) while imports are significant (49.1% of GDP). About 70% of the islands' supplies are imported from Canada or from other parts of France via Nova Scotia. The euro functions as the official currency of Saint Pierre and Miquelon. The Canadian dollar is also widely accepted and used, but change is usually given in euros. The "Institut d'émission des départements d'outre-mer" (IEDOM), the French public institution responsible for issuing currency in the overseas territories that use the euro on behalf of the Bank of France, has had an agency in Saint Pierre since 1978. The islands have issued their own stamps from 1885 to the present, except for a period between 1 April 1978 and 3 February 1986 when French stamps not specific to Saint Pierre and Miquelon were used. The total population of the islands at the January 2011 census was 6,080, of which 5,456 lived in Saint-Pierre and 624 in Miquelon-Langlade. At the 1999 census, 76% of the population was born on the archipelago, while 16.1% were born in metropolitan France, a sharp increase from the 10.2% in 1990. In the same census, less than 1% of the population reported being a foreign national. The archipelago has a high emigration rate, especially among young adults, who often leave for their studies without returning afterwards. Even at the time of the great prosperity of the cod fishery, the population growth had always been constrained by the geographic remoteness, harsh climate and infertile soils. While some ruins show a presence of indigenous American people on the archipelago, it is unlikely that there were year-round settlements beyond occasional fishing and hunting expeditions. The current population is the result of inflows of settlers from the French ports, mostly Normans, Basques, Bretons and Saintongeais, and also from the historic area of Acadia in Canada (Gaspé Peninsula, parts of New Brunswick, Prince Edward Island and Cape Breton) as well as francophones who settled in Port au Port Peninsula on the island of Newfoundland. The inhabitants speak French; their customs and traditions are similar to the ones found in metropolitan France. The French spoken on the archipelago is closer to Metropolitan French than to Canadian French but maintains a number of unique features. Basque, formerly spoken in private settings by people of Basque ancestry, had disappeared from the island by the late 1950s. The population is overwhelmingly Christian, with the majority being Roman Catholic. The Roman Catholic Vicariate Apostolic of Iles Saint-Pierre and Miquelon used to manage the local church until it was merged into the French diocese of La Rochelle and Saintes in 2018. Every summer there is a Basque Festival, which has demonstrations of harrijasotzaile (stone heaving), aizkolari (lumberjack skills), and Basque pelota. The local cuisine is mostly based on seafood such as lobster, snow crab, mussels, and especially cod. Ice hockey is very popular in Saint-Pierre and Miquelon, with local teams often competing in Newfoundland-based leagues. Several players from the islands have played on French and Canadian teams and even participated on France men's national ice hockey team in the Olympics. Street names are not commonly used on the islands. Directions and locations are commonly given using nicknames and the names of nearby residents. The only time the guillotine was used in North America was in Saint-Pierre in the late 19th century. Joseph Néel was convicted of killing Mr Coupard on Île aux Chiens on 30 December 1888, and executed by guillotine on 24 August 1889. The guillotine had to be shipped from Martinique and it did not arrive in working order. It was very difficult to get anyone to perform the execution; finally a recent immigrant was coaxed into doing the job. This event was the inspiration for the film The Widow of Saint-Pierre (La Veuve de Saint-Pierre) released in 2000. The guillotine is now in a museum in Saint-Pierre. A direct air link between the islands and mainland France did not exist until 2018. Although the 1999 opening of the Saint-Pierre Airport was intended to overcome this problem, a direct air link was not established until Air Saint-Pierre announced it would conduct direct seasonal flights from Paris in the summer of 2018, starting on 2 July. Until then, all flights from and to Saint-Pierre passed through Canada. Air Saint-Pierre's ATR 42 aircraft flies seasonally from the Canadian airports of Sydney and Stephenville, and year-round from Halifax, Montreal, and St John's. With regular service from April to November or December, a passenger-only ferry connects the Newfoundland town of Fortune with Saint-Pierre. The ferry also operates year-round between Saint-Pierre, Langlade, and Miquelon. On 2 May 2018, The Canadian Press announced that a pair of automobile ferries will be added at Fortune, Newfoundland, later in 2018. These ferries will deliver passengers and automobiles to and from Saint-Pierre. During 2019 direct flights from Saint Pierre to Paris will be in service between 24 June and 11 September. Saint-Pierre and Miquelon has four radio stations; all stations operate on the FM band, with the last stations converted from the AM band in 2004. Three of the stations are on Saint-Pierre, two of which are owned by Outre-Mer 1ère, along with one 1ère station on Miquelon. At night, these stations broadcast France-Inter. The other station (Radio Atlantique) is an affiliate of Radio France Internationale. The nation is linked to North America and Europe by satellite communications for telephone and television service. The department of Saint-Pierre and Miquelon is served by three television stations: Saint-Pierre-et-Miquelon 1ère (call letters FQN) on Channel 8, with a repeater on Channel 31, and France Ô on Channel 6. While Saint-Pierre and Miquelon use the French SECAM-K1 standard for television broadcasts, the local telecommunications provider (SPM Telecom) carries many North American television stations and cable channels, converted from North America's NTSC standard. In addition, Saint-Pierre-et-Miquelon 1ère is carried on Shaw Direct satellite and most digital cable services in Canada, converted to NTSC. SPM Telecom is also the department's main Internet Service Provider, with its internet service being named "Cheznoo" (a play on Chez-Nous, French for "Our Place"). SPM Telecom also offers cellular phone and mobile phone service (for phones that adhere to the GSM standard). SPM Telecom uses the GSM 900 MHz band, which is different from the GSM 850 MHz and 1900 MHz bands used in the rest of North America. The islands are treated as a separate country-level entity among radio amateurs, identifiable with ITU prefix "FP". Visiting radio amateurs, mainly from the US, activate Saint-Pierre and Miquelon every year on amateur radio frequencies. The islands are well known among radio amateurs, who collect contacts with these stations for Islands on the Air and DX Century Club awards; the geographic location of Saint Pierre and Miquelon gives a very good takeoff for shortwave communication all over the world. The archipelago has four primary schools (Saint Odile, Henriette Bonin, Feu Rouge, les Quatre-Temps), one middle school (Collège de Miquelon/College Saint-Christophe) with an annex in Miquelon, one state (government) high school (Lycée-collège d’Etat Emile Letournel) and one vocational high school. The students who wish to further their studies after high school are granted access to scholarships to study overseas. Many students go to metropolitan France, although some go to Canada (mainly in Quebec and New Brunswick), and the United States. Saint Pierre's institute for higher learning is the Institut Frecker, which is associated with Memorial University of Newfoundland. Since 2000, Frecker had been operated by the Government of Saint Pierre and Miquelon, with support of the federal government of Canada and the provincial government of Newfoundland and Labrador. Saint-Pierre and Miquelon's health care system is entirely public and free. In 1994, France and Canada signed an agreement allowing the residents of the archipelago to be treated in St. John's. In 2015 St-Pierre and Miquelon indicated they would start looking for a new healthcare provider as recent rate increases by Eastern Health in Newfoundland were too expensive (increasing to $3.3 million in 2014 from $2.5 million in 2010). Currently Halifax, Nova Scotia and Moncton, New Brunswick are possible locations. Since 1985 Hôpital François Dunan provides basic care and emergency care for residents of both islands. The island's first hospital was military in 1904 and became a civilian facility in 1905. L’Hôpital-Hospice-Orphelinat opened in 1937. While most apparatus are older second hand units from North America, St Pierre acquired an aerial ladder from France in 2016. ^ a b c INSEE, Government of France. "Populations légales 2011 pour les départements et les collectivités d'outre-mer" (in French). Retrieved 26 January 2014. ^ a b "Evaluation du PIB 2004 de Saint-Pierre-et-Miquelon – janvier 2007" (PDF). p. 24. Archived from the original (PDF) on 9 February 2013. Retrieved 8 February 2013. ^ a b c d e f "Saint Pierre and Miquelon". The World Factbook. Central Intelligence Agency. ^ Premio Real (22 February 2005). 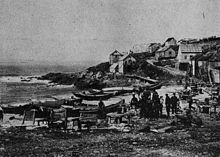 "Les iles Saint-Pierre et Miquelon – Notes de la conférence donnée à l'Institut Canadien, devant la Société Géographique de Québec, le 29 avril 1880, par Son Excellence le comte de Premio-Real, consul-général d'Espagne". Ia600302.us.archive.org. Retrieved 8 February 2013. ^ "Flight distance from Brest, France to Saint Pierre and Miquelon". Travelmath.com. Retrieved 8 February 2013. ^ a b "St. Pierre et Miquelon". Newfoundland and Labrador Heritage. Retrieved 8 February 2013. ^ "PATRON SAINT INDEX TOPIC: fishermen, anglers". Catholic Community Forum. Archived from the original on 20 February 2007. ^ "The Basques of Saint Pierre and Miquelon". Buber's Basque Page. 30 April 2006. Retrieved 8 February 2013. ^ a b "Tourism Agencies in Saint Pierre et Miquelon". 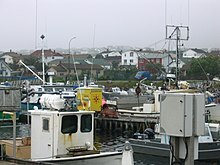 St-pierre-et-miquelon.com. Retrieved 27 September 2007. ^ a b c d e f g h i j k l "Le recensement de la population à Saint-Pierre-et-Miquelon" (PDF). INSEE. August 2000. Retrieved 8 February 2013. Chisholm, Hugh, ed. (1922). "St. Pierre and Miquelon" . Encyclopædia Britannica. 32 (12th ed.). London & New York. p. 344. ^ "St. Pierre And Miquelon Imported 1,815,271 Gallons From Canada in Twelve Months". The New York Times. 25 October 1931. Retrieved 8 February 2013. ^ a b "St Pierre and Miquelon". BBC News. 2 November 2011. Retrieved 8 February 2013. ^ "St Pierre Stays French". The Calgary Herald. 18 December 1958. Retrieved 8 February 2013. ^ a b c d e f "Le recensement de la population à Saint-Pierre-et-Miquelon en 2006". Insee. Retrieved 8 February 2013. ^ a b c "Saint-Pierre et Miquelon, Statut spécifique". Sodepar. Retrieved 8 February 2013. ^ "La préfecture". Portail internet des services de l'Etat. 7 December 2008. Archived from the original on 1 April 2012. Retrieved 8 February 2013. 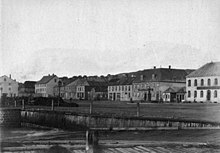 ^ "Préfet de Saint-Pierre-et-Miquelon". Portail internet des services de l'Etat. Retrieved 18 December 2016. ^ Berly, Michel; Bastien, Jean-Marie. "Historique: Site non officiel de la gendarmerie nationale" (in French). Retrieved 7 August 2010. ^ "Ocean Guardian II: September 13–14, 2005; Evaluation Report" (PDF). Canadian Coast Guard. Retrieved 7 August 2010. ^ "La Gendarmerie Nationale". Portail internet des services de l'Etat. 24 February 2011. Archived from the original on 12 April 2012. Retrieved 8 February 2013. ^ "St Pierre and Miquelon – Squaring off for a seabed scrap". The Economist. 7 May 2009. Retrieved 8 February 2013. ^ a b c d e "Rapport annuel 2010 IEDOM Saint-Pierre-et-Miquelon" (PDF). p. 16. Retrieved 8 February 2013. ^ a b James Marsh. "Saint-Pierre and Miquelon". The Canadian Encyclopedia. Retrieved 8 February 2013. ^ "La Géologie des îles Saint-Pierre et Miquelon". Encyclopédie des îles Saint-Pierre & Miquelon (in French). Miquelon Conseil. Archived from the original on 11 January 2006. ^ "Saint Pierre Temperature Averages". Weatherbase. Retrieved 3 February 2015. ^ a b c "Présentation". L'Outre-Mer. Retrieved 8 February 2013. ^ "Statistiques: Saint Pierre, Saint-Pierre-et-Miquelon" (in French). Météo France. Retrieved 10 October 2016. ^ "Records pour la station de Saint Pierre" (in French). Météo France. Retrieved 10 October 2016. ^ Law, Bill (8 March 2006). "French islands bid for oil-rich sea". BBC News. Retrieved 8 February 2013. ^ a b "Rapport annuel 2010 IEDOM Saint-Pierre-et-Miquelon" (PDF). p. 29. Retrieved 8 February 2013. ^ "Evaluation du PIB 2004 de Saint-Pierre-et-Miquelon – janvier 2007" (PDF). p. 32. Archived from the original (PDF) on 9 February 2013. Retrieved 8 February 2013. ^ "Council decision of 31 December 1998 concerning the monetary arrangements in the French territorial communities of Saint-Pierre-et-Miquelon and Mayotte". 31 December 1998. Retrieved 30 May 2010. ^ "Saint-Pierre-et-Miquelon". IEDOM. Retrieved 8 February 2013. ^ "ST. PIERRE ET MIQUELON". Online Catalogue. Stanley Gibbons. Retrieved 1 December 2007. ^ "Population totale au recensement: Saint-Pierre-et-Miquelon (serie historique 1847–1962)". Bdm.insee.fr. Retrieved 8 February 2013. ^ "Population totale au recensement: Saint-Pierre-et-Miquelon". Bdm.insee.fr. 31 December 2012. Retrieved 8 February 2013. ^ INSEE, Government of France. "Populations légales 2011 pour les communes de Saint-Pierre-et-Miquelon" (in French). Retrieved 26 January 2014. ^ "Le français parlé aux îles Saint-Pierre et Miquelon". Le GrandColombier.com. 29 April 2010. Archived from the original on 5 April 2012. Retrieved 8 February 2013. ^ Marc Cormier. "The Basque colony of Saint-Pierre et Miquelon". Archived from the original on 2 June 2012. Retrieved 8 February 2013. ^ "Religions In St. Pierre And Miquelon". Religion-facts.com. Retrieved 19 September 2017. ^ "Rinuncia del Vicario Apostolico di Iles Saint-Pierre et Miquelon e accorpamento del Vicariato nella Diocesi di La Rochelle (Francia)". Official Website of the Holy See (in Italian). Retrieved 1 March 2018. ^ "'Zazpiak Bat' Basque Club" (in French). Retrieved 28 June 2010. ^ "Saint-Pierre-et-Miquelon". 2011, Année des Outre-mer. 28 January 2011. Archived from the original on 8 September 2012. Retrieved 8 February 2013. ^ Emile SASCO. "Historique des Rues de Saint-Pierre". Encyclopédie des îles Saint-Pierre & Miquelon (in French). Miquelon Conseil. Archived from the original on 11 May 2011. ^ "Tourism in Saint-Pierre and Miquelon islands – How to get here". Comité Régional du Tourisme. Retrieved 8 February 2013. ^ "Conseil Territorial de Saint-Pierre et Miquelon – Régie Transports Maritimes – Rotations du Cabestan" (in French). Archived from the original on 17 December 2014. Retrieved 16 December 2014. ^ "GSM Coverage Maps – Saint-Pierre and Miquelon". Retrieved 4 July 2010. ^ a b c "Overview". Saint-Pierre and Miquelon Community Profile. Retrieved 8 February 2013. ^ "Department of Modern Languages, Literatures and Cultures". Memorial University of Newfoundland. Retrieved 1 June 2018. ^ Walsh, Adam. "St-Pierre-Miquelon shopping around for a health provider, N.L. prices too steep". CBC News. Canadian Broadcasting Corporation. Retrieved 18 February 2015. ^ "Portail internet des services de l'Etat: Le Centre Hospitalier François Dunan" (in French). Archived from the original on 19 May 2009. Retrieved 4 July 2010. ^ "Centre Hospitalier François Dunan". Ch-fdunan.fr. Retrieved 19 September 2017. ^ "Accueil". sapeurs-pompiers975. 20 June 2014. Retrieved 19 September 2017. ^ Par depute975. "Le Député en visite chez les sapeurs-pompiers de Miquelon » TOUTE L'ACTU". Depute975.net. Retrieved 19 September 2017. ^ "Véhicules des pompiers français – Page 1802". Auto titre. Retrieved 19 September 2017. Thomas, Martin (1997). "Deferring to Vichy in the Western Hemisphere: The St. Pierre and Miquelon Affair of 1941". International History Review. 19 (4): 809–835. doi:10.1080/07075332.1997.9640805.